2018 Catalina 445...Ready for Final Equipment! The hull 445's hull form is optimized to provide a gentle, predictable motion underway. The deck is strikingly handsome with a low profile cabin structure, twin helm stations and a roomy cockpit with tall, secure comfortable coamings and a cockpit table that seats 4-6. Below has the modern feel of sleek lines with the elegance of hand-finished teak and teak veneers throughout. Private staterooms with innerspring mattresses, a true cook’s galley, and the innovative “flex space cabin” offer all the amenities needed for extended cruising or day-sailing with friends. The accomodations are designed for live-aboard comfort. The owner's cabin is forward for privacy and optimum natural ventilation. The interior is constructed of teak and teak veneers, hand-finished with durable clear varnishes, highlighting the natural beauty of fine woods. Cabin aft to port is a flexible space, easily converted to whatever your cruising style dictates at the time. Large L-shaped galley conveniently located at portside foot of companionway steps. Based on a new hull design with a long waterline and moderate beam and freeboard, the 445 has excellent performance potiential. 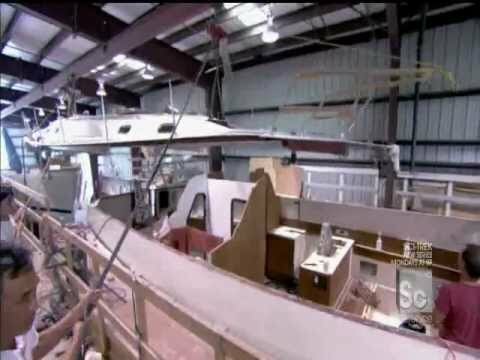 The hull form is optimized to provide the gentle, predictable motion underway, which is appreciated in other Catalina models. The deck is strikingly handsome with a low profile cabin structure, twin helm stations and a roomy cockpit with tall, scure coamings and a table that seats 4 to 6. The deck is finished with tradtional diamond-patterned non-skid.